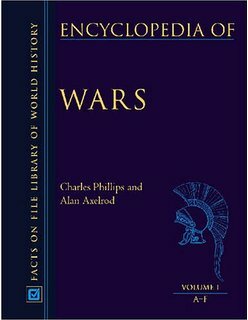 Clear and compelling, The "Encyclopedia of War" documents every major war or significant period of conflict in over 5,000 years of human history. The history of warfare first emerges from legend in Mesopotamia, the cradle of civilization, around 3,000 years before the birth of Christ. From these first battles, war traces the campaigns and conflicts that have shaped world history and examines the evolution of military tactics and technology. This book includes the story of the development from these primitive battles to the global conflicts of the 20th century and the modern "War on Terror" reflects the same political, cultural, and technological forces that have defined human history.